Craft beer, just as with any other infatuation or hobby, you need to learn the jargon to fully experience the culture. The world of beer is nothing but a world of lingo that you learn along the way and unlike algebra or calculus this new realm of vocabulary is fun. When I first got into beer I didn’t know a porter from a stout or what the heck IPA stood for. It took a few months to fully appreciate and dive into craft beer, then once I took residency in this colorful world I had some knowledge to learn the language to get around. Apart from the names of the different brews, equipment the beer is made in, ingredients used to make beer, the names of the stages of making beer,serving vessels and even gas used in the beer: you need to learn about the containers to store and drink beer from. Of course everyone knows the pint glass. Every bar, beer festival and brewery serve their beers out of the classic pint glass that fills up the kitchen cabinets of every college student. But what about a growler? 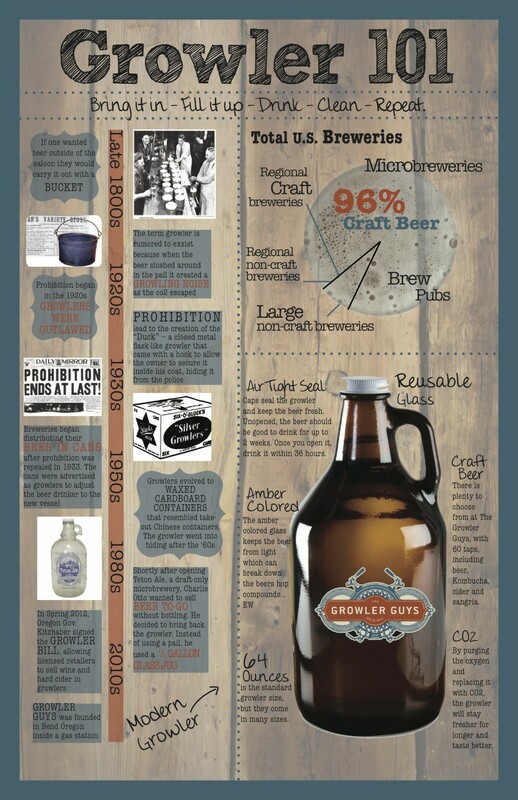 Growlers are not new to the beer scene. They have evolved from a bucket with a lid to the fancy containers we see today. Recently this has become the trendiest accessory to tote beer around in, but what is it and is it worth a try? I was not at first a fan of the growler. My train of thought was: why would I want to have a jug sitting in my fridge that will not keep for very long, when I could buy a six pack with roughly the same amount of beer that I don’t have to worry about going flat? But I am naturally curious and a curious beer enthusiast I knew I had to get on board with the growler. I wanted to get a growler I would love to look at and carry around to refill. Right now I am living in Corvallis, Ore., and have an excellent selection of pubs and breweries to get a growler and fill it. After some thinking and some research I found out that my favorite brewpub in Corvallis has a deal on Tuesdays- Growler Tuesdays- so the decision pretty much made itself. 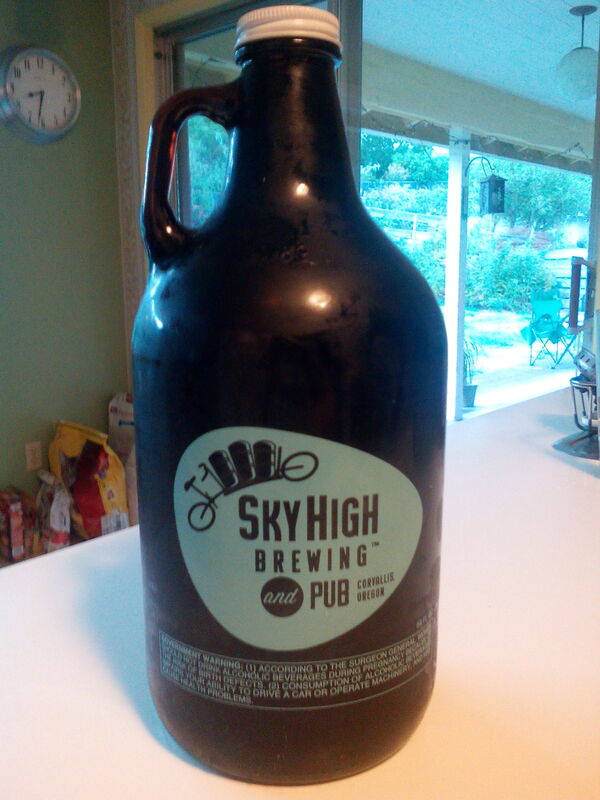 My roommate Sydney and I went to Sky High brewing in Corvallis to acquire a matching set of 64 ounce growlers filled with one of the best beers I’ve had in this college town, the Panorama Porter. This dark beer has layers of flavors of rich caramel and dark malts. The Panorama Porter is inspired from a classic British recipe and is amped up with the German Tettnanger hop and locally grown Oregon Cascade hop. Now that I have a growler of my own, I can take advantage of the opportunities that I didn’t have before with craft beer. One of the benefits of having your own beer storage is that you are able to take home draught selections straight from the tap. Just as delicious as spring water; it is beer right from the source. There are many local places here that make fantastic beer and aren’t sold commercially. But now with my growler I can have those brews within reach. Another benefit of using growlers is limiting beer’s carbon footprint. Instead of buying six individual bottles every time you go out and buy beer you just have the one reusable container. Also, to refill a growler costs as much as buying a craft six pack. Check around at your local filling stations or brewpubs to see what their daily rates are for a refill or if they are like many places in Corvallis that have a weekly promotion on fill-ups. With great beer comes great experiences. Give the growler a chance to show you its greatness.